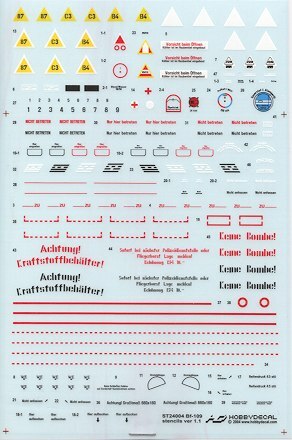 Every once in a while, there comes along something that just grabs your attention and so it is with these new releases from HobbyDecal. These are stencil decals but the main difference is that they are dry transfer. For years, armor modelers have used dry transfer decals to provide the highest quality markings for their models. There are several plusses and minuses that go along with these decals and I've borrowed the following info from the HobbyDecal web site to give you all a rundown on them. - Dry Transfer is a definitely more realistic medium than existing water slide decals for modeling. - It is an easier and faster method than decals in transferring and finishing. - There is no silvering effect after transferring. - In most finishing cases, you do not need to try to spray and spray with top coats to hide decal film on your work. - Of course, you also do not need to use other decal solutions or solvents. - The surface of marking after transferring can be polished flatter than decals. - Missing transfer dots or fragments can be easily fixed with modeling enamels or paints of the same color. Yes there are some Defects. - You need to be more careful not to scratch or crack the transferred marking with rough handling. - It is impossible to change location after transferring. - It is harder to place transfers on the surface of irregularly curved, sharply bent or tightly cornered areas. - Printing is a more involved and difficult process, resulting in higher prices. 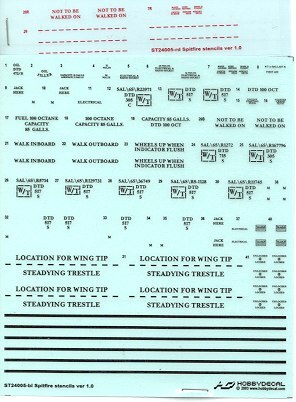 These two sheets are for the 1/24 Spitfire and Bf-109G. No kit is specified, but it really matters little as stencils are generally good for most any aircraft in the appropriate scale. You may also note that there is no placement guild. One really is not needed as these are designed to replace the kit offerings. However, if you really need them, then they are available from the 'Downloads' section of HobbyDecal's website. I have to mention, however, that I had some trouble getting the entire sheet to show up when I tried to print a hard copy. What I ended up having to do was to save the image to my hard drive, then bring up the image in my editing software and change the long end of the image to 800 pixels in order to get the entire image to fit on a sheet of paper. I can tell you for certain that once you get the hang of using dry transfer decals, you'll appreciate all that they have to offer over the standard water-slide versions. One of the merits not mentioned is that often dry transfers are more crisply printed than the usual decals and these are very well done.